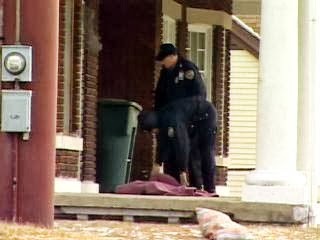 OHIO -- Investigators in Dayton said a police officer is recovering after being bitten by a pit bull. The incident happened Monday as officers responded to a call that the dog attacked someone in the 1800 block of North Main Street. Police said it was at an apartment complex where they searched for the dog bite victim but what they found was much scarier. Investigators said they found [a pit bull which was so severely injured] that officers had to shoot. Police said they looked for a victim but no one confronted them but two bit pulls. They said one of them lunged at an officer, biting her in the leg. Investigators said the dog then retreated but then went for another officer. Police said both officers opened fire, killing the dog. Officers said the other pit bull was taken by animal control and taken to a shelter. They said the dog that did the biting will be tested for rabies. Police said no one is claiming to owning the dogs. If they do, they could face charges. 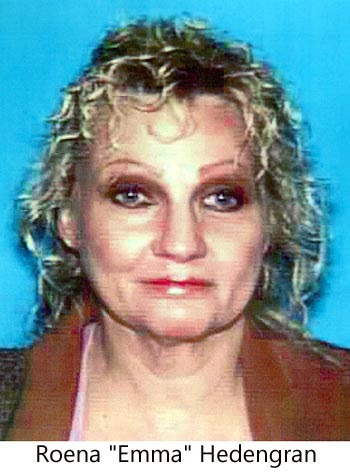 NEVADA -- Gert "Abby" Hedengran got the hell out of California. He and his wife, purveyors of an exotic animal sanctuary, lost a Siberian tiger in the suburbs of San Diego and then allegedly told authorities they didn't own the 350-pound feline, which roamed for three weeks before it was shot. RIP Tuffy. 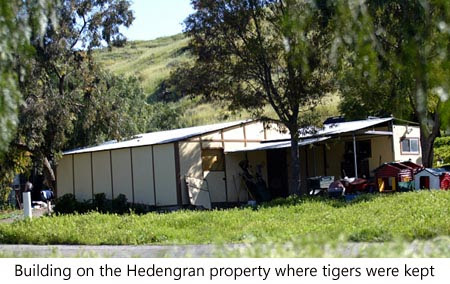 Facing federal litigation, the Hedengrans and their menagerie - 21 exotic cats in all, including two more tigers and three lions - fled to the town of Pahrump, Nevada. But the Nevada town where Gert Hedengran sought solace in 2005 didn't exactly extend a welcoming hand to the big-cat collector. Hedengran got death threats. All around him, Pahrump residents debate the practicalities of keeping big cats - or dogs with wolf blood, pythons or any exotic animals - as pets. This argument over exotics captures something of Pahrump's future. The small town, set in one of the country's most desolate counties, shoulders explosive growth. The result is a mounting tension between longtime residents, who sought freedom in the remote, and new-to-town retirees and discount-rent snipers, who inadvertently import a cosmopolitan sensibility. It's a sign that times are changing in Nye County - a Wild West tamed and ever tamer. Hedengran, whose attorney insists he's mum to the press, may unwittingly advance the cause against exotic animal owners. Nye County officials have long entertained imposing more stringent regulations on exotic pet ownership. Unfortunately for Hedengran, he's an immediate and shining example of careless cat ownership. Zuzana Kukol, who lives on the outskirts of Pahrump with a tiger named Pepper, a lion named Bam-Bam, a bobcat named Jasmine and an ocelot named Isis, puts it simply: "They wanted to do all these regulations before Abby came to town. Abby just gave them a reason to bring it up again. "But how are regulations going to keep idiots from doing stupid things?" According to the criminal complaint filed against him, Hedengran was relocating his Temecula, Calif., animal sanctuary to Moorpark, about 130 miles away, when Tuffy and a Siberian lynx escaped in early 2005. 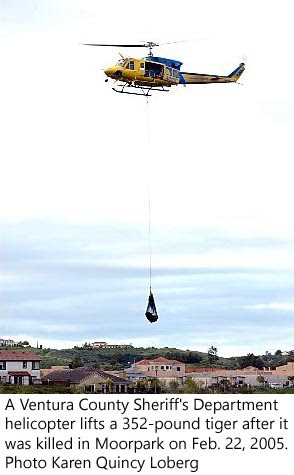 The lynx was quickly tranquilized and captured on someone's front porch. Hedengran told California game wardens he didn't immediately notice the animal was missing. He told the authorities nothing of Tuffy. Soon, the tiger sightings started. By Feb. 4 of that year, a game warden confirmed from a paw-print trail that an exotic cat was on the loose. Hedengran still said nothing. By Feb. 11, wardens were asking Hedengran whether all his animals were accounted for. Hedengran said they were. 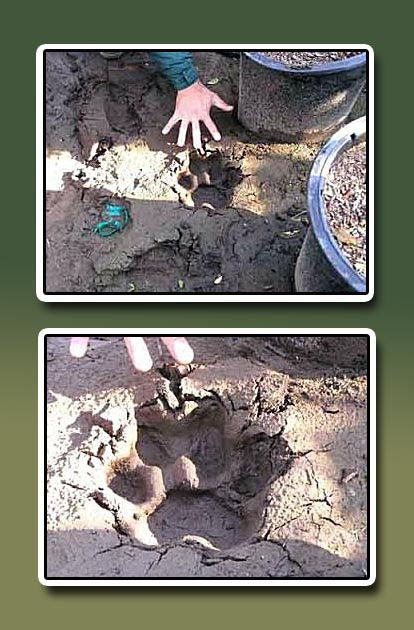 By Feb. 16, Hedengran was summoned to an area ranch to examine some large paw prints. He was spotted intentionally dragging his boot through the tracks. The following day, Hedengran was seen pacing the ranch with a tranquilizer gun. On Feb. 23, Tuffy was shot by a federal trapper near a school and park. Experts identified the animal by its stripes - fur fingerprinting. "The tiger appeared to have not eaten for several days," the complaint reads, "perhaps not since its escape." Hedengran pleaded guilty in California courts earlier this month to felony obstruction of justice and making false statements. He is awaiting sentencing in April and faces more than a year in prison. In the meantime, Hedengran and his wife are caring for their pets in Pahrump, where animal control officials report the couple is abiding by exotic animal regulations. Of course, Nye County animal control officer Debbie Pemberton openly admits, "at this point in time, we basically have no regulations." At least not yet. With the backing of county brass, Pemberton began drafting an animal control ordinance last year. The ordinance sought the establishment of several regulations, though none so controversial as those addressing exotic animals. Of particular irritation was the proposal that exotic pet owners should carry a minimum of $1 million in liability insurance and that anyone living within a one-mile radius of such animals should be formally informed. There would be annual fees and twice-annual inspections. Outrage from animal owners prompted Nye County commissioners to quash the ordinance as worded in October. But the battle has just begun. Nye County is over 18,000 square miles in size and has more than 40,000 residents, the vast majority clustered around Pahrump. Census estimates suggest the county grew by almost 25 percent between 2000 and 2005, and city planning committee member Mark Kimball is quick to note that another 20,000 homes have been approved for development. "Twenty years ago, anybody who wanted to do anything could probably go to Pahrump. Almost anything. If you wanted to hide, you could go to Pahrump," Kimball said. "As the town gets larger and larger, you are going to need, in my judgment, reasonable guidelines for reasonable activity. "It's just not reasonable anymore to assume you can do what you want to do." After last year's exotic ordinance outcry, Kimball started an ad hoc animal advisory board that now meets regularly. By spring, the board plans to propose a new set of animal regulations. For exotic owners like Kukol, a lanky Czech tiger trainer, Pemberton's ordinance set an unsavory precedent. To Kukol, the $1 million insurance requirement is a tacit attempt to force exotic owners into relinquishing their animals. No one could afford the premiums, she says. And informing everybody within a one-mile radius? That's the stuff of pedophiles, she says, not pet owners. Kukol is allergic to cats, and can't keep tabbies in the house. Outside, her allergies aren't irritated by her tigers. "Tigers are better than dogs," she says. "They don't bark." There were 17 attacks by big cats in the U.S. in 2005, according to the Captive Wild Animal Protection Coalition. That tally, the group's most recent annual total, includes Pahrump resident Sandy Allman, who lost a finger after she was bitten by a leopard belonging to former Nye County animal control chief Karl Mitchell. He was imprisoned on theft charges and cited by the U.S. Department of Agriculture for violations of the Animal Welfare Act. The coalition estimates that there are 10,000 to 20,000 privately owned big cats in the U.S.
"I mean, you just cannot live your life on what if. You cannot ban something because something might happen," Kukol says. "Punish for deeds, not for breeds and species." For Pahrump officials, however, might is more than enough. An exotic feline at large in Nye County could take several expensive weeks to track down, most likely by helicopter, Pemberton says. "Because we are very rural, you get a cat that gets out, you have some kid on his motorcycle riding in the desert, what the cat does, we don't know," she said. "But if that cat gets ahold of him, we do know that it's not going to be anything we want to experience." There are four known big-cat owners in Pahrump, and possibly a fifth, a recluse whose feline husbandry can't be confirmed. Brian Turner owns a leopard and two cougars. His Runnin' Wild nature center is licensed to serve as a temporary holding facility for rescued exotic animals, typically wolves. Turner is against the proposed exotic animal ordinance. More bluntly, he's against Pahrump. "There is this Draconian idea burgeoning within the planning commission to create these restrictions and regulations," he said. "I'm not looking forward to anything that's coming out of this, and frankly, I wish I could just leave Pahrump altogether." Turner can't leave because he has sunk his savings into the nature center, which doesn't turn much of a profit. "Out here the only business is European tourists who might come by in the winter, on their way to somewhere else," he said. The cost of keeping exotic animals could skyrocket if Nye County's ad hoc animal control board proposes additional caging requirements, annual licensing fees and expensive insurance policies. Rick J. Lindsay, president of Evolution Insurance Brokers, one of the country's only exotic animal insurers, estimates that a $1 million animal liability package would cost at least $5,000 to $7,000 annually. Roughly 30 percent of the approximately 2,000 exotic animal owners Lindsay insures keep big cats, though for cost reasons, most private owners go without insurance. "It's all manageable risk if you do it right," he said. "The problem is when their wealth goes south. That is where the risk really skyrockets." 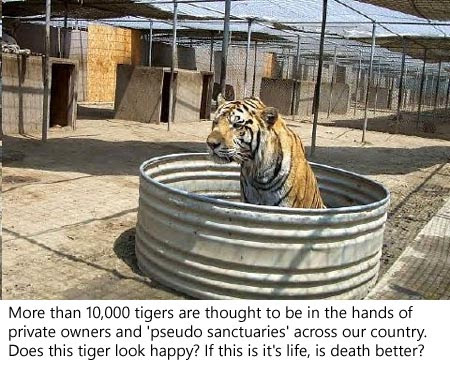 WHY IS A NON-PROFIT 'RESCUE' SPENDING $75K BUYING A TIGER FROM A BREEDER??? Money was certainly a problem for Hedengran. An Indiana exotics breeder who sold a $75,000 "white lioness" named Sitara to Hedengran is suing him for failure to make payments on the pet. Richard Maier, a California real estate broker who has known Hedengran for more than 40 years, says Hedengran lived off charitable donations to his nonprofit Tiger Creek Foundation. Maier said he loaned Hedengran more than $100,000 in 2002 to help the hemorrhaging foundation out of the red and still hasn't seen any repayment. Maier has stopped speaking to Hedengran. "He discovered the foundation was a good way to get money from people," Maier said. "Abby's a very intelligent, very manipulative con artist. There is no other way to put it." Fiascoes like these solidify Nye County Sheriff Tony DeMeo's support of the proposed animal regulations, and his disdain for people who want to keep their pets private. "A lot of the people that are bucking the system are people that for a long time have been getting a free ride," he said. "They're not taking these animals seriously, and they're not taking their responsibility seriously." Kukol counters that extinction - both of exotic animals and Pahrump freedoms - is a threat worth fighting against. In a letter to the editor of Pahrump's daily paper, Kukol levied a battle cry: "I am sick and tired of the people who, like me, move here from urbanized areas but then, unlike me, try to change it to be like the old 'home,' " she wrote. "I have a bit of advice for these folks: If you are against freedom, guns, exotic animals, prostitution and gambling, do not move here. Leave and go home. Please, leave us alone so we can enjoy one of the few islands of freedom and peace in an otherwise overregulated world." 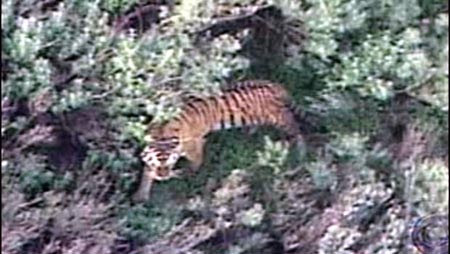 California: Hedengrans Arrested in Tiger's Escape. The Moorpark animal sanctuary owners denied the cat belonged to them while it roamed suburban areas. Trackers killed it Feb. 23. NORTH CAROLINA -- The Wilson County Humane Society has been at odds with the county’s animal control office in the past. But now, the two agencies have worked together in a case that led to a dog owner’s arrest. Daryel Newsome, 55, is charged with three misdemeanor and one felony count of animal abuse. Investigators said they discovered about 50 dogs -- mostly pugs -- living in rows of stacked kennels. “It was just a nasty situation,” she said. Newsome was unavailable for comment, but contractor Tony Holloman told WRAL he has done work on Newsome's home. He said Newsome might have had too many dogs, but he took good care of them. “I personally feel like the animal cruelty charges were just nonsense, because I don't see how he was cruel to the animals at all,” Holloman said. However, Carmichael said the conditions that the dogs were found in were not healthy. 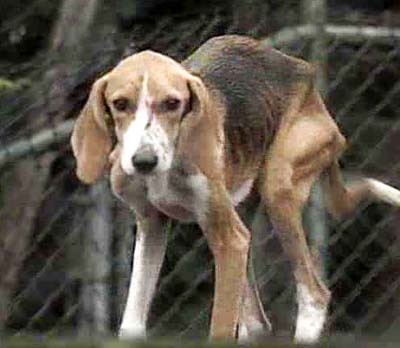 In October, Wilson County Animal Control officials investigated a complaint about dozens of Walker hounds that were said to be starving. No criminal charges were filed after the agency said most of the dogs appeared to be in good health. The Wilson County Humane Society expressed their outrage over the statement, and the case prompted a county review. In November, hundreds of citizens attended a meeting of the county’s Animal Control Committee. But in the latest case, several county agencies and nonprofits worked together to remove Newsome's dogs and place them in rescues. “It was really a good felling to know that we can cooperate and to see what we can do when we do cooperate,” Carmichael said. Most of the dogs seized have gone to a pug rescue organization based in Greensboro. Veterinarians have begun to evaluate the health of the dogs.